Super Bowl Sunday Snowpocalypse PsychoCross D.C. Stage Race!! Snow? That's not snow. The pits at Capital Cross. Proteus Bikes’ Super Bowl of Singlespeed may have been pushed back a week but that does not mean there will be no cyclocross racing in the Nation’s Capital this Sunday. Tim Rugg (Battley Harley/Sonoma) and Justin “Rez” Resnick (District Velocity/The Bike Rack) are not going to let the forecasted 36 to 360 inches of snow stop them from racing. Before we get the details of what these guys have planned, I have to say I’m a little worried that Rez is spearheading this effort. As we saw way back in September, slippery surfaces are not always his forte. For those that may have missed it, here’s a recap. WOOH SNOW CROSS!! Spread the word, this is gonna be AAAAWESOME. We could use some extra orange sport cones to set up the courses so please bring some if you have them! Newbies, spectators, hecklers, snowball throwers, and photographers welcome! 09:45am – Optional breakfast at Open City Cafe. 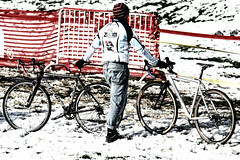 11:00am – Meet-up at Rock Creek Park exercise area, set up course, do preview lap. Stage 1 – Rock Creek Park exercise area start at 11:30 SHARP. Race TBD laps until 11:55 or so. 12:15pm – Meet-up at Calvert St Bridge park, set up course, do preview lap. Stage 2 – Calvert St Bridge park at 12:30 SHARP. Race TBD laps until 12:55 or so. LUNCH BREAK and frolicking in Adams-Morgan!! 2:15pm – Meet-up at City Bikes to ride over to Malcolm X Park. 2:30pm – Meet-up at Malcolm X, set up course, do preview lap. Race TBD laps until 3 or so. I’m in. See you there. Riding the bike is optional if racing – but you’ll have to carry it the entire time. great…so long as it the results don’t get posted to crossresults.com!